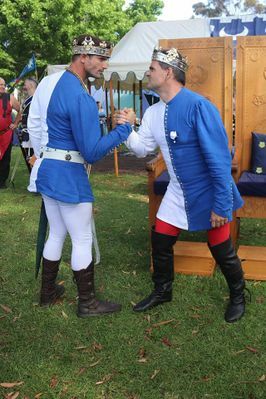 At Crown Tournament on 3/11/2018, Agrippa Morris, fighting for Dawid Radzowycz defeated Duke Patrick O'Malley of Ulidia. Agrippa was wreathed as al-Caid and Dawid as Lord Caid. 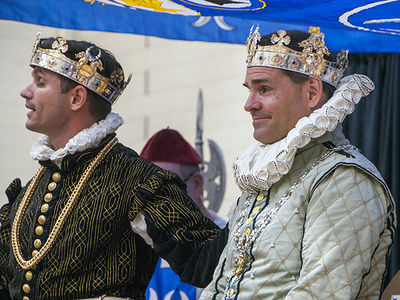 Their Coronation took place on June 23 at Caid's 40th Anniversary and Coronation 2018. 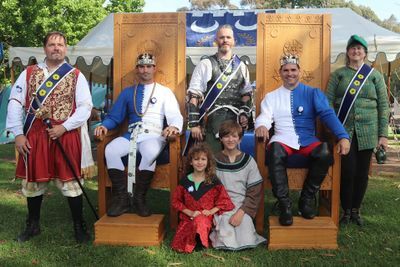 Come now Kings Agrippa and Dawid, undoubted Kings of Caid, who send Their warmest greetings to the magnificent populace of these Crescent Lands! This past month has been a time of transition and travel. 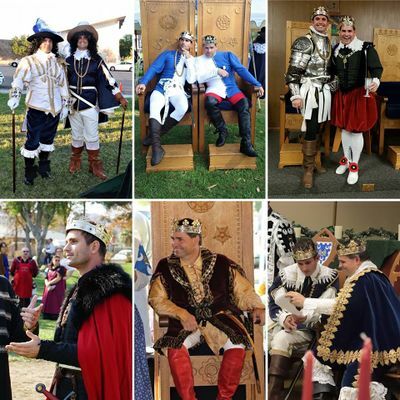 We ventured forth to Calafia and Naevehjem to install the new Barons and Baronesses. 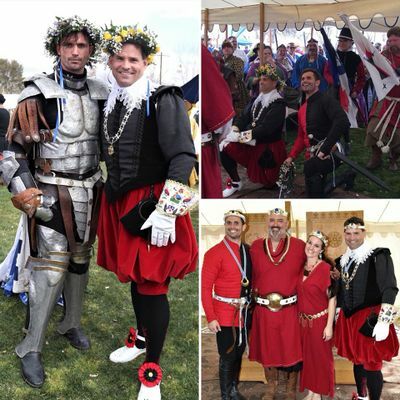 We were also delighted to join with the people of Isles to celebrate their anniversary. As We begin the celebrations of the holiday season, we look forward to joining with the peo-ple of Our Baronies of Starkhafn, Altavia, and Angels to enjoy their Yule festivities. With the changing of the seasons, the days grow short and so does Our time on the Dolphin Thrones. But Twelfth Night approaches, and with it, a new day will begin as We transfer the Crowns to Our Heirs. We hope that everyone who is able will join us for this joyous occasion! In closing this, Our last missive to you as the Crown, know that it has been a tremendous honor to have the privilege of serving Caid as its Kings, and We will remain ever grateful for the support and love which you have shown Us. We thank you all, from the very bottom of Our hearts. Long Live the Kingdom of Caid, and may its glorious populace ever prosper! This page was last modified on 13 January 2019, at 06:51.